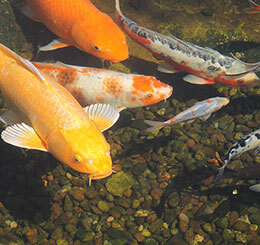 All-In-One Filtration Units: Submersible mechanical, biological and ultraviolet filtration systems such as the ClearSolution™ G2 should be pulled from your water feature, cleaned and stowed away for the winter in a place that will not freeze. Pressurized Filters: As with the All-In-One Filtration Units, plan to remove pressurized filters such as the AllClear™ G2 and put it up for the cold-weather season. Doing so will prolong the life of your unit’s temperature-sensitive parts. Ion Clarifiers: Algae won’t likely be growing out of control in the winter, so you can disconnect your ion clarifier and keep it stashed until the warm weather arrives. 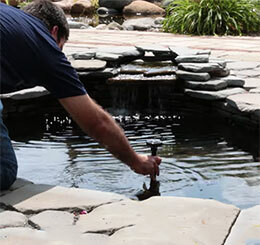 The Pond Guy® Water Garden Aeration Kit is designed to aerate medium sized water gardens and koi ponds up to 4,000 gallons. It’s powered by an energy-efficient aeration pump and includes a diffuser plate for maximum oxygen uptake and a weighted airline.